There are certain things you can rely upon in an episode of The Apprentice. Nick will look totally bemused at least three times, one contestant will claim they're an expert at something only to then display total inefficiency at the same thing and Lord Sugar will point at one unlucky contestant and tell them they're fired. Your mother probably told you it was rude to point but Lord Sugar, and his fellow pointers, have blissfully disregarded this advice. Here's to their sheer abandon. Since he's an alien, chances are E.T. isn't aware of how rude pointing can be on earth. To be fair, his finger was also much more powerful than the average human one. Firstly it could glow, which is cool, and secondly it could read books, which is definitely worth showing off. Amazingly, we think, you can actually buy your own E.T. finger too. If you were of an impressionable age in the 90s, chances are you spent most Saturday evenings captivated by scantily clad athletes undertaking variously bizarre physical challenges. Chances are you were also desperate to get your hand in one of the foam pointers which audience members frantically gestured towards the stage. With age, you realised that a massive foam hand wasn't such a must-have. Now, it's taken us a while to fully understand Aussie Rules football. But after about six decent attempts, we think we now get what all the pointing is about. The goal umpire uses his fingers to signal points and goals. That's right there are points and goals. Damn it, we're lost again. In Kevin Smith's Dogma, the Catholic Church decide that they need to make it all a little bit less depressing and create a fun alternative to the whole crucifix image. Buddy Christ is a winking, smiling and pointing guy who you could easily imagine going for a beer with. Mainly because you could buy a water and he'd turn it into beer for you. At the beginning of WWI, it was completely acceptable to use finger-pointing in a rude way. 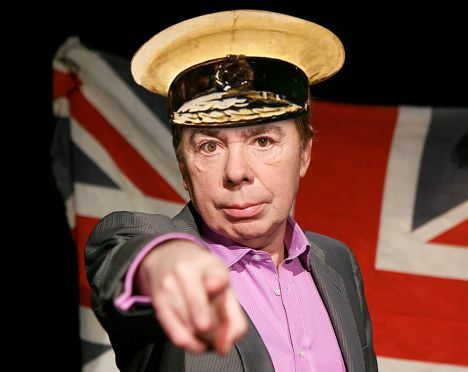 Lord Kitchener, appointed the Secretary of State for War, was in need of volunteers to sign up and serve and wasn't going to get them by asking kindly. The iconic poster has been parodied endlessly, most depressingly in this image. The lottery ads always told us, quite vaguely and never accurately, that it could be you. Just to hammer the point home, they also included a massive, rather sinister hand that would point at some random member of the public to inform them of their win. Since the chances of winning were 1 in 14 million, you have to wonder what the evil hand had in store for the remaining 13,999,999 suckers. Paul Whitehouse's impression of Michael Caine has become so ingrained in our memory that we often find it hard to differentiate between reality and fiction. So, we therefore can't remember if the real Caine actually pointed that much. But as Michael Paine, Whitehouse pointed at the camera relentlessly as he ranted about his neighbours. In case you'd forgotten, here's a reminder. Using the ability to point for something actually useful, the English hunting dog helps to highlight the location of birds so that they can be murdered by their owners. While some might consider this a rude reason to point, others who enjoy a fancy gastro-meal will be temporarily grateful. The worringly speedy Jamaican athlete uses the 'To Di World' pose to celebrate his many successes and before you could say bandwagon, there was the Facebook group, the Puma campaign and the dance move. One of the most popular and profitable pointing incidents of late. Just to ensure that the process of being fired on television, in front of millions, is as humiliating as humanly possible, Lord Sugar also utilises his forceful finger to further highlight the inefficiency and overall uselessness of the departing contestant. Whatever the occasion, even if it's just to point out that you have gum in your hair, you don't want to be on the receiving end of a Sugar point.